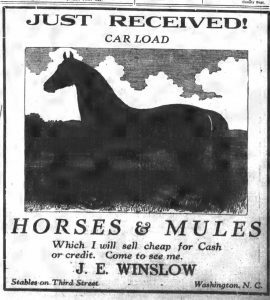 An advertisement from the September 19, 1916 issue. Two more years of the Washington Daily News from 1915-1916 are now online, joining previously digitized issues from 1909-1914. These issues were provided by our partner, the George H. and Laura E. Brown Library. The Washington Daily News is a newspaper serving Washington, North Carolina, a small city located in Beaufort County, North Carolina. The paper was started in 1909 and exists today under the same name. 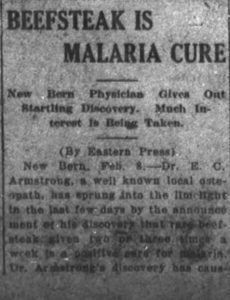 An interesting pronouncement in the February 8, 1916 issue. The newly digitized issues were published six days a week and covered events of both local and national importance. Included are stories about the local and national economy, politics, notable events, businesses advertisements, town gossip, and commentary on farming and industry around Washington, North Carolina. 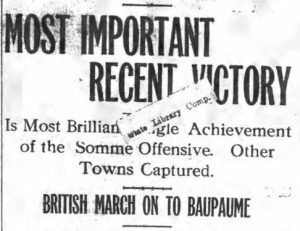 The paper also provided Washingtonians almost daily updates about World War I which was raging abroad. To browse through all the digitized issues of the Washington Daily News, click here. To see more materials from the George H. and Laura E. Brown Library, visit their DigitalNC partner page, or take a look at their website. An article updating Washington residents about the war front in the September 26, 1916 issue.